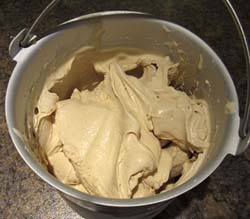 Real vanilla is my favorite ice cream recipe flavor and one that I never tire of making. It has a taste that's hard to define, somehow exotic and irresistable. Welcome! Here will you find lots of different recipes for making homemade ice cream including sorbets and gelato, especially if you have an ice cream maker. 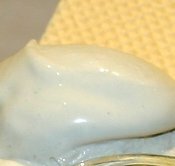 There are so many facets to the subject of ice cream - you might want to know more about the' evergreen' of desserts - the sundae for example - or by complete contrast you might prefer an ice cream sandwich or enjoy trying different toppings or even reading about the historical side of things. New recipes and Special Features are added regularly so I hope you will visit time and again to enjoy the passion that I have to share with you. Latest Recipe : A soft Rocky Road ice cream which I made for my family and served fresh from my machine at home. Whatever the occasion, whether it's just a family meal or a special celebration, homemade ice cream is always a welcome treat. With so many recipes to choose from you can have great fun and here are some tips on making ice cream to help you along the way. There's so much to learn - for example, have you thought about the importance of hygiene before you start a recipe? 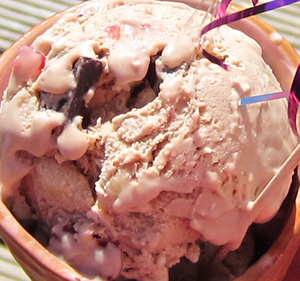 Rocky Road is one of the more unusual ice creams you can make at home and there are plenty more to try. When it comes to popular flavors you can probably guess the top 3 - good old vanilla followed by chocolate and then strawberry. You can read the rest of the top 10 most popular on my page about the top 10 recipes downloaded from this website. Like this 2 Quart machine on the left which you can also use for making sorbets and yogurt. 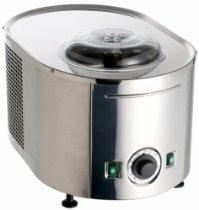 If you are looking for a quality machine then a premium gelato machine could be the ideal gift. The stainless steel model on the right is made in Italy where they produce some of the best ice cream in the world! Popcorn Or Oyster & Caviar Flavor Monsieur? FRENCH ICE CREAM ... now that's a little different! Whilst visiting France I tested a selection of locally made ice creams. I was not disappointed - they were delicious! The way they make 'glace maison' in France is not particularly different BUT it's how they serve it and the unusual flavors they come up with. The blue and white cone in the picture was one I bought in France. Click on it to read my special feature. GOTHIC ICE CREAM - a great idea! 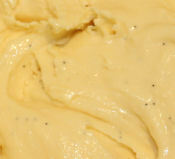 Grey and alluring, this licorice toffee ice cream (see photo) could be the perfect winter treat. If you prefer of course you can always go with the ever popular vanilla.You can try my really easy vanilla recipe made with just 3 ingredients and in just 2 steps. Whichever recipe you choose, I hope you enjoy it. 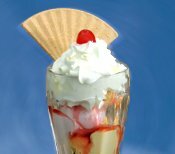 If you are looking for ideas on how to present it, go to my sundaes page for some inspiration. If you enjoy making your own desserts, then trying unusual ice cream recipes is great fun! I've been doing it for years and the resulting list on this site is free for you to try yourself. However, I stilll have many more ideas 'in the works' so keep returning to check for every more unusual flavors. 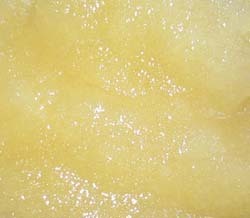 Other delicious and unusual flavors that I have enjoyed making include a white wine sorbet. This alcoholic sorbet is ideal for dinner parties and special celebrations - adults only! Another alcoholic sorbet you could also try is my sloe gin sorbet which was a real eye-opener of a recipe when I first made it. Absolutely delicious. Thank you to my friend Shirley for making the sloe gin and inspiring me to try it as a sorbet. Strasberry ice cream - if you have never tried strasberries (pictured above right) read my dedicated page here. My recipe was the very first strasberry ice cream ever published on the Internet and I had enormous fun getting hold of the strasberries (not easy!) and then making the ice cream. Click on the photo to read more and then go make some of your own.